How does the facilitator effectively use her/his power in this role without stepping on or directing people? There needs to be a balance between giving voice and being silent, or giving voice to others. Silence is a key strategy to building group dynamics. Silence is ineffective if it is not ACTIVE LISTENING and active engagement in which each group member honestly acknowledges that they heard the other person. Silence sometimes creates a feeling of anxiety in students since it disrupts the expected teacher role. Allow discomfort, a space to think about differences and for differences to be heard. Leave a space, be patient, and eventually others will jump in and present their ideas and viewpoints. Also important to building group dynamics is the use of the circle as a way to make sure that each member of the group has an opportunity to provide their perspectives and insights. 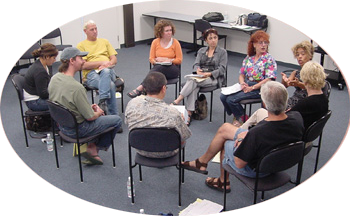 Each member should be expected to contribute to the discussion, by taking turns in responding to important questions under group consideration. Participants can pass their turn in the circle and then the facilitator can circle back to ask those who passed to contribute when ready. However, everyone should understand that they are expected to participate. And the facilitator’s role often requires reminding individuals to not interrupt another.